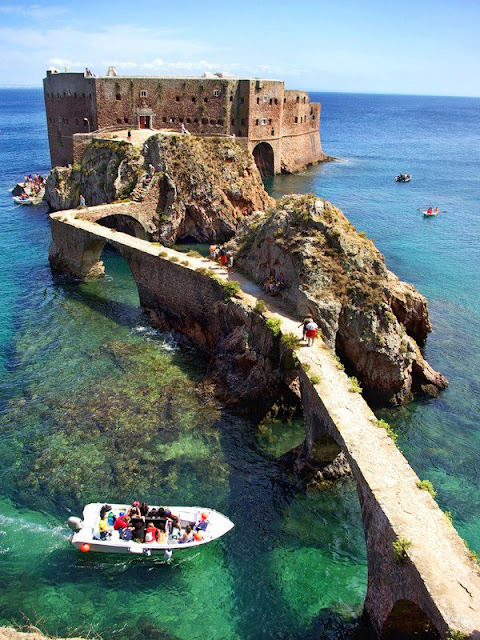 The Fort of São João Baptista das Berlengas, or simply known as the Fort of the Berlengas, is located off western coast of Portugal, on the largest island of the archipelago of the Berlengas, in the municipality of Peniche. The fortification belonged to a group of defensive military structures meant to protect the municipality located on the coast. King Manuel of Portugal ordered the construction of a fortress on Berlenga Grande in 1502, which was immediately rectified under the reign of King Sebastian of Portugal. The fort, was constructed from the remains of a pre-existing monastery (the Monastery of the Misericórdia da Berlenga) which had previously been abandoned. Hieronymite monks had in the early 16th century, decided that the Berlengas were well situated to provide aid for seafearing people in need of shelter. The islands isolation also provided ideal conditions for the monks to live in austerity through solitude and silence, assiduous prayer and healthy penance. But, the monks became victims of frequent attacks by Algerian, Moroccan, English, and French pirates and privateers. Further, violent weather often cut-off communication to the mainland, which was especially distressing during pirate incursions, as result, the Monastery was abandoned.